What did you choose for your makeup? We know there are a huge demand of swatch of no-edited photos. To our sorry, the counters are too far for us, and it is too rude to take swatch photo on the counters. 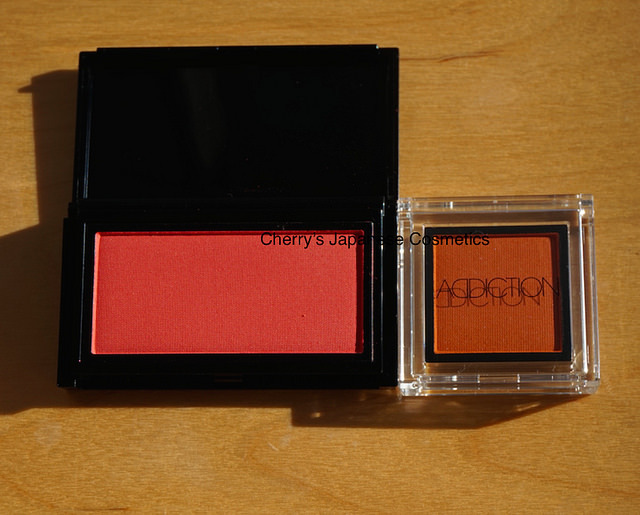 So, we review some makeup items what exactly Cherry bought, and basically they are regular products. Of course I buy limited items as I want, I had thought in this SS2017, I would choose limited creamy blush by RMK, or SUQQU new eyeshadow. But seeing the photos of ADDICTION SS2017, there are no choice to buy! Let me apply in my arm. I had expected the Blush was more bloody color, but this color is also lovely. Do not forget blushes if you want to look naturally healthy! This #40 Favorite Little Dress is “matte”, when we Japanese see the term of “matte”, we expect how to say… no shine product, but I found there are quite, quite small glitters when I apply on my arm. Anyway, what I mean is, this less shine blush makes my face naturally aflame look. The Eyeshadow #114 is orange. Darker, but vivid isn’t it? There are also quite small glitter I found, but can not see on the picture. ADDICTION the eyeshadow is one of the eyeshadows what tends to be brightly-colored on your face. I know some people use red/ orange/ coral/ pink eyeshadows on their cheeks as blushes. It makes your makeup unity that fixing the shade of blush and lip. But when you also add that color on your eyes, it will be too much, I am afraid of. If you want to use this eyeshadow on your blush, it will be nice, but I do not recommend to use on your eyes too. To my sorry, they are limited products, and we have already stopped to have your order of those colors. The eyeshadow #114 is hopeless to get for you, and as of 12th of Jan, seems Blush #40 is still few on the stores, but we can not promise for you. So, we have already stopped to do. If you eager to have limited products, I guess it will be March what is the next release month, please stick your eyes on here “Limited & Seasonal”. We may accept your pre-order only. The regular colors of ADDICTION are also fantastic.